The Ruby Throated Humming Bird is the smallest bird on the East Coast of North America. The Humming Bird TreePOD is one of three of the smallest TreePOD available at Treetop Haven. It is a 425 square foot TreePOD (geodesic dome) that perches 9 feet up in the trees sitting on a large deck that surrounds the entire dome. This TreePOD is beautifully decorated with accents and special touches that are inspired by the Humming Bird. The Humming Bird TreePOD has a fully equipped kitchen that includes a fridge, a free standing stove, and of course a coffee maker. It also contains all of the dishes, cutlery, glasses, pots, and pans that you will need. 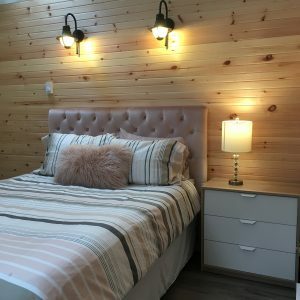 The Humming Bird has a beautiful 4 piece bathroom complete with a tub/shower, a relaxing one bedroom with a queen size bed, and a small living space containing a small sectional couch that turns into a double bed. 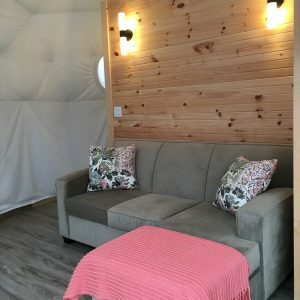 There is a large bay window that wraps around the kitchen and living room to allow the enchanting woods to feel as though it is in the TreePOD with you, without having to leave the comfort of the couch. Although the Humming Bird TreePOD is only 425 square feet on the inside, it has a large wrap around deck which enlarges the living space, while bringing the outdoors in. The outside area features your own private hot tub. Imagine relaxing in the tub after a wonderful day of hiking and exploring beautiful PEI. The large outside area also has a barbecue and seating area, great for eating outside, while embracing nature. Hummingbirds prefer red-orange, purple, and blue tubular flowers, which you will find around the deck. Hopefully you can spot some of these amazing birds. Humming Birds have an average wing beat of 60 to 70 beats per second, which enables them to hover, fly backwards, forwards, up, and down. They live in wooded areas, gardens or parks with flowers, clearings, and old fields. Humming Birds do leave us in the winter for the warmer weather. They migrate anywhere from Mexico to Central America. The Humming Bird TreePOD is open from May until October. Pets and smoking are not allowed.